Light and perfect as a make-up base. An invisible mesh of minerals protects skin from sun’s rays (SPF 10). It does not leave smudges and its moisturising composition provides all-day performance. Removes all skin impurities and dissolves sebum. Removes even waterproof make-up without causing irritation. Leaves your skin soft and well-nourished. Suitable for all skin types: nourishes and moisturises dry skin, regulates combination skin and oily skin. The microfibre cloth attached to the product gently scrubs the skin. It pushes out your wrinkles, reduces bags under eyes and swelling, illuminates eye gaze. Helps you regain comfort you miss. It tones and improves performance of blood vessels. Keeps bacteria at bay, cleans and refreshes, and soothes irritations. It contains precious ingredients and is a pleasure to use. A spray bottle lets you apply a mist that moisturises your skin. The proper composition of he toner ensures multifunctional performance. Attracts impurities like a magnet and absorbs excessive sebum. Easily removes even eye makeup without leaving smudges. Moisturises and has anti-bacterial function. Allows for maintaining the natural balance of your skin. A spray bottle facilitates proper dosing and ensures product efficiency. Visibly firms, tightens and brightens the skin, restoring its youthfully fresh and smooth look. The first effects can be noticed after 24 hours after the first application. Thanks to the serum you will obtain a natural effect similar as applying a botulinum. Perfect for all skin types. Resibo is an excellent gift for those whom we want to please by giving them the best of what nature has to offer. In exquisite packaging, we have closed three products - nourishing cream, eye cream and our new product - naturally smoothing serum. Each of them is full of natural components of the highest quality that will help you to take care of the health of your skin at any age. Deeply moisturises all skin layers, leaving it silky smooth, firm, and youthful. Regenerates, softens, and enhances even very dry skin at the cellular level. It is very light, so does not leave an oily residue while protecting the skin. The magical scent of Tahitian Gardenia is activated with the warmth of your skin. It will transport you straight to the tropical islands. It protects, moisturises, nourishes and regenerates lip skin. Thanks to the Brassica Alba Sprout Extract, it shows natural redness of the lips, increases lip volume, enhances mouth contour and restores its natural succulence. Sweetness of stevia makes us more eager to use the balm more often, thus caring for the lips regularly. It is also really pleasant to use thanks to natural freshness of mango. Your ally in fighting imperfections and skin aging. Gently removes dead epidermis, nourishes, moisturises and illuminates the skin. Smoothes wrinkles. The skin will be healthier and more radiant by the day. It brings an effect of a skin full of natural glow all day long. Illuminates and enhances skin’s appearance in two ways – the mica powder creates a delicate film on imperfections of the skin, and advanced plant extracts decrease redness. Visually corrects imperfections and shallow wrinkles. It combines perfectly with makeup and other cosmetics and they work together beautifully on the skin. Warm and cool colours of the mica particles match with all skin tones. A product for special tasks. Visibly slims and shapes the silhouette. Effectively reduces cellulite. Makes your skin firm, nourished and moisturised, supporting its natural protecting and regenerating features. Biała koszulka powinna obowiązkowo znajdować się w szafie każdej eleganckiej kobiety. Jest idealną bazą dla różnego rodzaju stylizacji, od codziennych, sportowych aż po te na wielkie wyjścia. Zwłaszcza gdy zdobi ją opalizujący, holograficzny napis, a rękawki są stylowo podwinięte. Taka właśnie jest nasza koszulka, promująca nową serię kosmetyków – GLOW. Po prostu – zakładasz i lśnisz! Daj się zauroczyć naturalną pielęgnacją. W Zestawie Zauroczenie znajdziesz dwa kosmetyki, które odmieniły oblicze pielęgnacji niejednej kobiety – olejek do demakijażu i krem pod oczy. Pierwszy delikatnie i dokładnie zmywa makijaż i oczyszcza twarz, jednocześnie ją nawilżając i odżywiając. Drugi – wspaniale nawilża i wygładza skórę wokół oczu, wypychając zmarszczki od środka. Zobacz, jak promienna może być Twoja skóra! Jeśli zatroszczysz się o swoje ciało, ono szybko okaże Ci wdzięczność. Jak? Promiennym, zdrowym i młodym wyglądem. Skóra, tak jak i Twój organizm, potrzebuje pokarmu. Najlepszy znajdziesz w odżywczych kosmetykach pielęgnacyjnych Resibo, które zamknęliśmy w świątecznym Zestawie Wdzięczność – kremie do twarzy i balsamie do ciała. Wypróbuj i zobacz, jak wdzięczna Ci będzie Twoja skóra. Multifunctional, light, intensively moisturising anti-aging cream, and your ally in the fight with so-called urban stress. 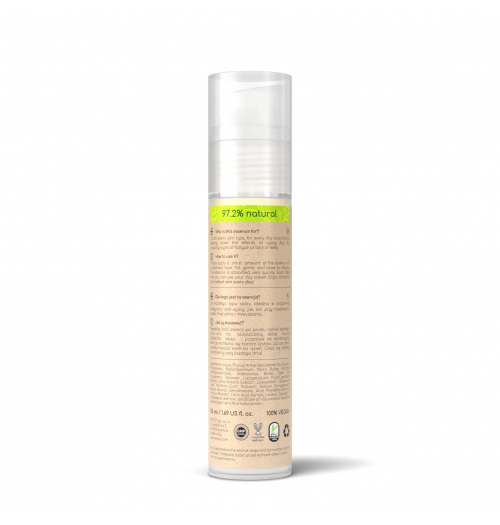 The cream is a natural mask protecting from environmental pollution, smog, harmful radiation from your computer or smartphone screen, UV radiation and excessive light. It is also a very effective day cream providing long-term nourishing and moisturising. It is absorbed easily and gives your skin a satin smooth finish. Perfect as a make-up base. Focus on your hands for a while. Take a good look at them. At their back. At their palms. Did you know their skin is the first to age in your whole body?! The hands do so much every day. They are exposed to so many harmful factors. Take good care of them. And we will help. Are you bothered with dry, sensitive and irritated skin? Do you run, climb or sail? Or maybe you have an outdoor job in changeable weather conditions? Wind, frost, sun, rain, snow… all of them have a negative impact on your skin. Did you know that your skin needs special protection and extraordinary care? How to help it? How to soothe unbearable irritations? We have a natural solution. Healthy glow Imperfections! If your skin knows them just too well, you know what it means to fight skin oiliness and inflammations every day… in the mirror you can see enlarged pores and excessively shiny skin. That is just not the kind of glow you want for your skin! We either. So we created a cosmetic which is an everyday support of your skin fighting imperfections. Perfect skin is – above all – healthy skin. To take care of it properly, begin with a clean sheet. The right cleansing routine and providing it with nutrients is essential. With the Perfect Skin set, the task is easier. Our best-selling Cleansing Oil easily removes even waterproof make up and cleanses it thoroughly. The Nourishing Cream is a natural, well-balanced diet for your skin – providing it with all it needs to be healthy and beautiful – and simply perfect. Did you know that your skin is exposed to everyday stress? But the worst one is so-called urban stress, caused by environment pollution, smog, or radiation from computers or smartphones. What’s more, their influence on skin aging process is much stronger than UVA rays. The Urban Skin Guard set is your safeguard against urban stress. The Micellar Water attracts impurities like a magnet, takes care of your skin, moisturises and soothes irritations. Instantly radiant skin? A big night out ahead and the face you see in a mirror isn’t looking radiant? The wrinkles seem more noticeable and your skin looks dry, tired, and lacks radiance? Remember that not only your age, but also an intense a lifestyle or lack of sleep and fresh air make the skin lose its natural firmness, smoothness and hydration. You can help it by regularly applying natural care. But what if you need an immediate results? Here's the answer! Protects and nourishes the lip skin. Increases lip volume. Highlights the natural redness of your lips. Soothing lip balm Perfector 3 in 1 is a unique composition of natural ingredients aiming at protection and moisture, as well as nourishment and regeneration of sensitive and demanding lip skin. It soothes the sensitive skin instantly, relieves irritation, prevents it from drying and cracking and acts as a natural dressing for the mouth. Thanks to the Brassica Alba Sprout Extract containing isothiocyanates – a substance protecting young plants from outer factors – the balm shows natural redness of the lips and makes them look slightly fuller, enhancing contour, shape and colour of the lips. The result is smooth, moisturised, full and succulent mouth. Use of ACTICIRE® – the unique combination of natural, vegetable waxes of mimosa flowers, jojoba and sunflower, nourishes and moisturises lip skin, leaving a light, non-greasy film, preventing the lips from water loss. Sweetness of stevia makes us more eager to use the balm more often, thus caring for the lips regularly. What is important, stevia is a plant that protects from decay. All this, combined with freshness of mango aroma, contributes to a real pleasure of application. It is for everybody, also for people with tendency to chapped, dry mouth. Apply a small amount of the balm to your lips. Use as often as needed. Galactoarabinan is a larch tree extract, a natural and gentle ingredient reducing trans epidermal water loss. Gently exfoliates and protects skin from the sun’s rays. Avocado oil is an easily absorbing and penetrates into deeper skin layers. it is a so-called seven-vitamin oil (A, B, D, E, H, K, PP) which moisturises intensively, nourishing epidermis and complements lipid barrier. Redens’in – an Indian tree called Commiphora Mukul resin extract. The substance causes increase of adipocytes in the subcutaneous fat layer, which “pushes out” wrinkles for a long time. AquaxtremTM is a rhubarb root extract that activates natural processes of skin moisturising, stimulates differentiation of keratinocytes. It regulates skin exfoliation process, strengthens mechanisms and elements of epidermal barrier, and the skin regains its moisture, radiance, smoothness and vitality. 100% natural organic glycol, obtained from corn that perfectly moisturises the skin and reduces risk of irritations or allergies. This ingredient shows anti-bacterial functions. Lakesis, an oil of „crystal tears” of the Pistacia lentiscus tree, cultivated on the Greek island of Chios, reactivates youth proteins – called Klotho, and synthesizes fibers strengthening the skin so it regains its density and looks fuller and firmer. This plant growing in Siberia offers a real richness of ingredients enhancing look and well-being of skin. Rich in vitamins A, E, B, and C, as well as carotene, it nourishes the skin and supports restoring its natural protective functions. It speeds up healing process of inflammations, strengthens skin with tendency to erythema and rosacea. The lungwort extract perfectly regulates metabolic processes in skin cells, strengthening and healing them. The organic composition of this extraordinary plant makes it perfect for any skin type. Brassica alba sprout extract – contains isothiocyanates, substances protecting young plants from outer factors. Thanks to it the balm shows natural redness of your lips and makes them look fuller, enhancing their contour, shape and colour. The result is smooth, moisturised, full and succulent mouth. Biologically active tripeptide, accelerating renewal of epidermis, significantly influences skin moisture and smoothes it, reducing wrinkles. The skin becomes radiant, smooth and illuminated. The first effect can be noticed after two weeks of regular application. Two types of mica powder match perfectly to each skin type, reflecting and scattering light. These particles, which are invisible individually, together create a perfectly silky film on your skin, smoothing and concealing imperfections. Together with other the moisturising and smoothing ingredients, the cream gives a magnificent glowing effect. Glowing skin all day long. The single celled Tisochrysis lutea alga extract, containing xanthophylls (natural colorants fighting free radicals) and rich in polyunsaturated fatty acids. LipoutTM transforms fat cells into cells burning fat and speeds up the thermogenesis process in the cells, enhances skin flexibility and resilience and has anti-cellulite properties. The effect is visibly slimmer and slenderer silhouette, as well as more flexible, resilient and healthier skin. It contains isothiocyanates, substances protecting young plants from outer factors. Thanks to it the balm shows natural redness of your lips and makes them look fuller, enhancing their contour, shape and colour. The result is smooth, moisturised, full and succulent mouth. A concentrated extract of Buddleja officinalis (Buddleja davidii), also called a butterfly bush, maintains correct physiology of the skin, protecting it from harmful effect of rays, like UVA, UVB, IT or concentrated blue light and visible light. A protective shield for your skin. Rich in saponins and polysaccharides, has smoothing and protective function. It moisturises and softens your skin. Perfect for dry, irritated and sensitive skin, as well as for capillary skin. Creates a light, non-greasy film, thus retaining water and ensuring accurate moisture level of stratum corneum, improving skin hydration. The Madonna lily flower extract is also well-known for protecting and skin softening properties. Obtained from Garcinia indica tree seeds, the butter contains plenty of unsaturated fatty acids that support cell oxygenation, thus facilitating absorption of other nutrients from the cream. Kokum butter literally transports them to deeper layers of skin. Softens, regenerates, smooths and makes your skin more flexible. Contains vitamin E, does not clog pores, absorbs quickly without leaving a sticky layer on your skin. The patented Nelupure™ extract, which is a combination of blue Egyptian lotus (Nymphaea caerulea) and Indian lotus, or so-called sacred lotus (Nelumbo nucifera) extracts provide cleanliness and glow of your skin. It works instantly, reducing production of leptin amino acid and thus stopping the process of serum overproduction and inflammations causing skin imperfections. Together with a proper cleansing routine and other ingredients of the serum, the extract will make your skin perfectly clean and balanced. The oligosaccharide obtained from the chicory gives the effect of an immediate facelift and the firming and tightening of the skin is long-lasting due to its use. It also visibly reduces wrinkles and by accelerating the collagen synthesis process, it produces about an anti-aging effect.